Hello all! 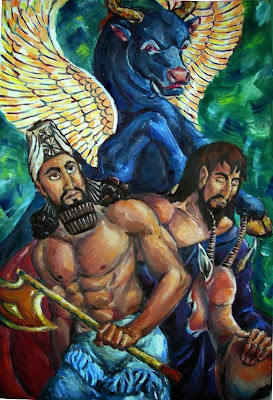 Welcome to the Flying Pincushion and this week’s theme of the Epic of Gilgamesh. This is my first week joining the wizards of words and write-ups and I’m honored to be among their number. For my part we’ll be taking a step back from the stats and rules and focusing more on the overseeing responsibility that is the Game Master. Knowledge of rules and story building aside, what traits make a GM truly great? For this we look to the Epic, particularly the character development of Enkidu the Wild Man. Enkidu was created by the gods as a companion and party member to Gilgamesh. His character sheet probably marks him as a human Druid/Barbarian hybrid with the alignment of Chaotic Good. His knowledge of the wild and strength of arm is matched by Gilgamesh alone and upon their first encounter demonstrates that he will act upon what he feels is right for the greater good. Soon after however the party of Gilgamesh and Enkidu is presented a quest. They must journey to the cedar forests and slay the guardian Humbaba. Upon learning of the challenge ahead Enkidu expresses his fear to Gilgamesh declaring that he has seen and knows of Humbaba and says that he is a foe that they cannot overcome. Gilgamesh presses his companion and prepares himself weapons, even seeking the guidance and blessing of the gods before setting off. When they reach the cedar forests their Game Master does a phenomenal job of presenting them with dreams pertaining to their quest, giving them more information on the guardian Humbaba through successful skill checks on the part of Enkidu. Still the wild man discourages Gilgamesh, believing that such an enemy is beyond them. When Humbaba finally shows himself Enkidu cries out that now is the time for Gilgamesh to live up to his boasting and press forward, the exact opposite of what he encouraged earlier. The battle is long and taxing but together the two overcome Humbaba. Before the killing blow Humbaba begs Gilgamesh to spare him promising to enter his servitude and gift to him all the trees of the forest, even saying that he will construct a palace for Gilgamesh. Gilgamesh is moved by compassion and would have spared the guardian if not for Enkidu. Enkidu insists that they must slay Humbaba and Gilgamesh gives heed to his companion striking down the guardian of the forest. Following their victory over Humbaba Gilgamesh is approached by the goddess of love and fertility Ishtar. He rebukes her, recounting to Ishtar her long history of broken hearts and promises. Enraged by rejection Ishtar demands that the gods unleash the Bull of Heaven on Uruk to punish Gilgamesh. Enkidu and Gilgamesh combat the bull and slay it following which Enkidu threatens and taunts the goddess Ishtar by throwing the bull’s right thigh at her. From there I would either readjust Enkidu’s alignment based on his actions or another viable option is to follow the course of Enkidu’s real GM, in this case the Epic itself. Upon their encounter with the Bull of Heaven the beast offers up three snorts, the third of which causes Enkidu to fall to the ground but quickly rise up and recover. This attack causes Enkidu to roll a save that he fails, causing him to fall ill following their defeat of the bull. From his sick bed Enkidu lets loose a string of curses, condemning the gods and the woman who enlightened him from his own wild nature. Enkidu’s bad luck continues as he fails more saves, dreaming of the underworld and suffering on a bed of pain for twelve agonizing days before dying. It is likely that his Game Master added on penalties for Enkidu’s past actions and decisions, choices that contradicted his alignment sending Enkidu into a downward spiral that ended in his own destruction. Though this example is a bit extreme it is also a strong reminder of the Game Master’s responsibility to hold our players accountable. When a player performs acts that contradict their alignment we must discover what caused them do so. The more digging we do and the more constructive questions we ask helps our players to better understand their character beyond what the stat sheets say. And in the instance that a player makes a poor decision that falls outside of their character it is an open invitation to the Game Master to bring them back before the consequences stack up beyond what they can scale. This is not a justification to seize control and micromanage our players. At times we must even take a step back and ask ourselves ‘Was this really fair? Did I act justly?’ As a Game Master we take upon ourselves the creation of worlds if nothing more than to act as the playground to our players. We learn the rules, write the stories, and guide our players through their adventure and the very psyche of their characters. It’s why we roll the dice in the first place.